Scientists have restarted the twin detectors of LIGO, the Laser Interferometer Gravitational-wave Observatory, after making several improvements to the system. Over 2017, they have made enhancements to LIGO’s lasers, electronics, and optics that have increased the observatory’s sensitivity by 10 to 25 percent. The detectors, scientists hope, will now be able to tune in to gravitational waves — and the extreme black hole and neutron-star events from which they arise — that emanate from farther out in the universe. On Sept. 14, 2015, LIGO’s detectors made the very first direct detection of gravitational waves, just two days after scientists restarted the observatory as Advanced LIGO — an upgraded version of LIGO’s two large interferometers, one located at Hanford, Washington, and the other 3,000 kilometers away in Livingston, Lousiana. After analyzing the signal, scientists determined that it was indeed a gravitational wave, which arose from the merger of two massive black holes 1.3 billion light years away. Now with LIGO’s latest upgrades, members of the LIGO Scientific Collaboration are hoping to detect more frequent signals of gravitational waves, arising from colliding black holes and other extreme cosmic phenomena. "The metric we most commonly use is the sensitivity to gravitational waves produced by the merger of two neutron stars, because we can easily calculate what we should see from such a system — but note we have not yet detected gravitational waves from a neutron star-neutron star merger. The Livingston detector is now sensitive enough to detect a merger from as far away as 200 million parsecs (660 million light years). This is about 25 percent farther than it could “see” in the first observing run. For the Hanford detector the corresponding sensitivity range is pretty much on par with what it was during the first run and is about 15 percent lower than these figures. 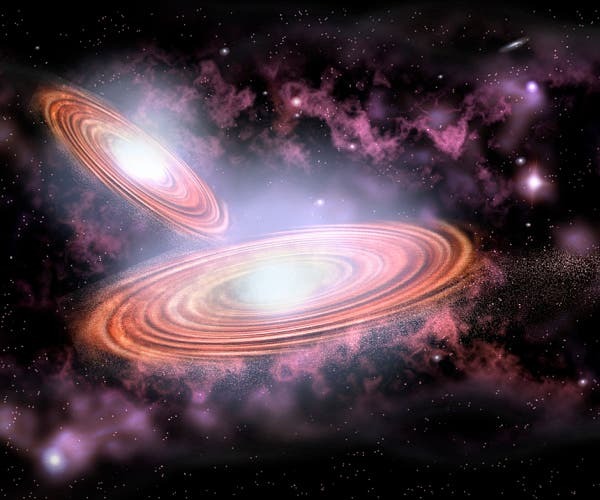 "Of course in the first observing run we detected the merger of two black holes, not neutron stars. The sensitivity comparison for black hole mergers is nonetheless about the same: Compared to last year’s observing run, the Livingston detector is around 25 percent more sensitive and the Hanford detector is about the same. But even small improvements in sensitivity can help, since the volume of space being probed, and thus the rate of gravitational-wave detections, grows as the cube of these distances." Fritschel also discussed what the LIGO Team hopes to “hear” and detect more black hole mergers, which is still a very exciting prospect. Recall that in the first run we detected two such black hole binary mergers and saw strong evidence for a third merger. With the modest improvement in sensitivity and the plan to collect more data than we did before, we should add to our knowledge of the black hole population in the universe. We would also love to detect gravitational waves from the merger of two neutron stars. We know these systems exist, but we don’t know how prevalent they are, so we can’t be sure how sensitivity we need to start seeing them. Binary neutron star mergers are interesting because (among other things) they are thought to be the producers and distributors of the heavy elements, such as the precious metals, that exist in our galaxy. 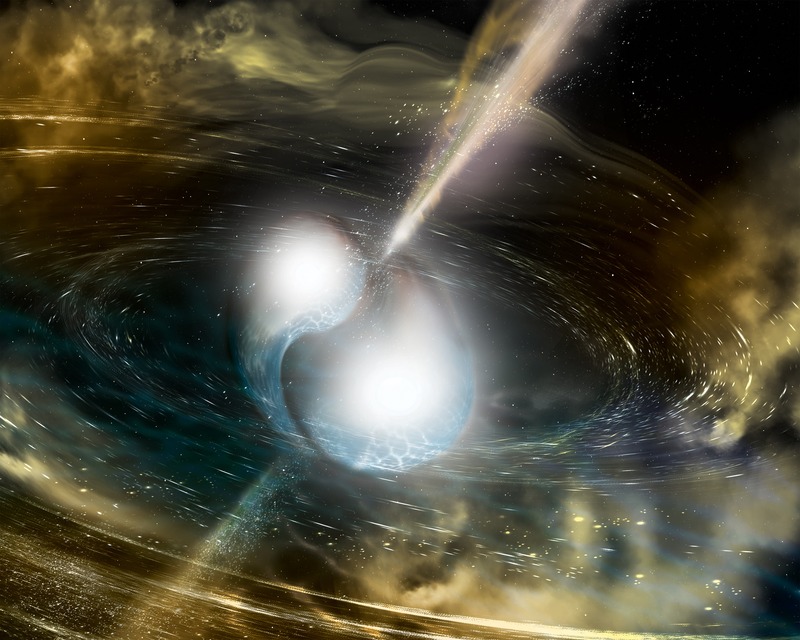 The artist’s illustration at the top of the page shows two merging neutron stars. The narrow beams represent the gamma-ray burst while the rippling spacetime grid indicates the isotropic gravitational waves that characterize the merger. Swirling clouds of material ejected from the merging stars are a possible source of the light that was seen at lower energies. (National Science Foundation/LIGO/Sonoma State University/A. Simonnet).